A major academic event on the potential of women to reach higher levels of command in the British military is being held at a top UK defence think-tank on Tuesday. The event 'Gender and Leadership: How Should Women Lead in Defence?' is being hosted by the Royal United Services Institute (RUSI). 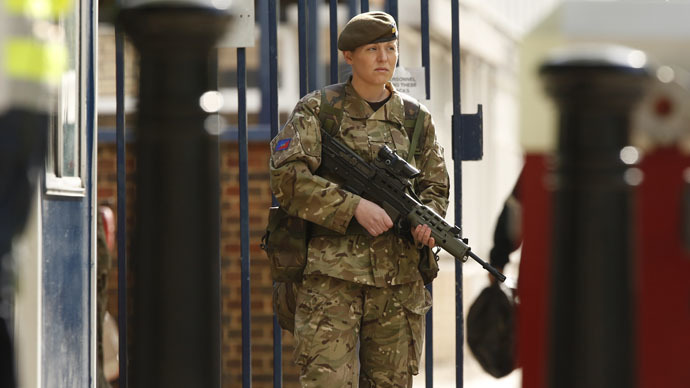 The conference aims to address how women can function as part of the military command structure at a time when austerity is affecting how the UK manages security. It comes as the armed forces and Ministry of Defence (MoD) make efforts to re-orient themselves to new emerging threats and adapt to budget constraints in a world where the politics of identity have been brought to the forefront. RT spoke to one of the events speakers, Dr. Victoria Basham, a senior lecturer at the University of Exeter and a specialist on race and gender in the British Armed Forces. When asked whether the military’s efforts are a serious move to increase recruiting through diversification or simply a PR veneer, she argued it was a mix of both. “It is fair to say there is a need to get people in the door,” said Basham. “It is easier to make the case for the reserves rather than the regulars,” she said, explaining that the initiatives are part of the Army 2020 recruitment scheme which focuses on convincing people to become part-time troops. Women looking for a military career are also put off by “outdated things like armed forces pin-ups,” she said. She also said there is a danger that the question of women and war risks obscuring the overarching question of how, why, and when the UK engages in fighting. The armed forces have made efforts to address both their material shortcomings and image problems. December 2014 saw the beginnings of a drive to bolster dwindling reserves by allowing those over the age of 50 to join the forces. So far in 2015, the military has begun asking recruits to declare their sexuality in a bid to improve diversity. The first openly transgender soldier – Captain Hannah Winterbourne – made public her struggles while asking the media not to “sensationalize” her story. Yet the military is still struggling with a reputation deficit and the lingering costs of damaging exposures and legal cases. A leaked document in 2012 revealed that every woman of every rank under General John Lorimer’s command had reported sexual harassment. The story of Royal Military Police (RMP) Corporal Anne-Marie Ellement is one of the most high profile recent cases. She committed suicide after claiming to have been raped by two male colleagues. No charges were ever brought. Her case was later championed by Liberty, a legal NGO.